While flipping through an April 2010 Conde Nast Traveler magazine (yes, I still read printed materials! ), the Room with A View article peeked my interest. It looked like the perfect spot for warmth after a long, snowy Vermont winter. The spot was Tulum, Mexico—just about a two-hour drive south of Cancun. 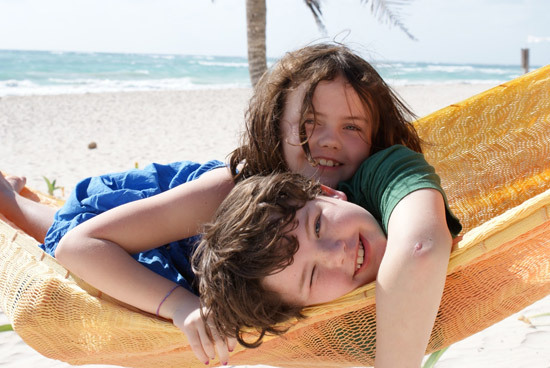 On a whim, we booked our first trip to the area called Tulum Beach and even chose the same hotel from the article—Playa Mambo. This “whatever/whenever” girl has traveled extensively with kids in toe. When I am on vacation, I usually like fresh towels and clean sheets every day, a/c, service by the pool; the luxuries that make a vacation into a holiday for Mom. For the most part, Tulum Beach isn’t like that. It is made up of affordable (starting at $100/night) casitas, casas and a few boutique-ish hotels set along a few miles of beach. I was a little skeptical to say the least, but my husband spurred me on just like he did when we went on a self-guided, no reservation tour of Ireland back in the day. As usual, his instincts were right but even he did not anticipate how truly amazing our Tulum vacation would really turn out to be. So much so we have now returned two years in a row. For the first time ever we decided we were going to ban all electronics on this vacation. Who needs them? We’d have the sand, the surf, each other…right? Right! 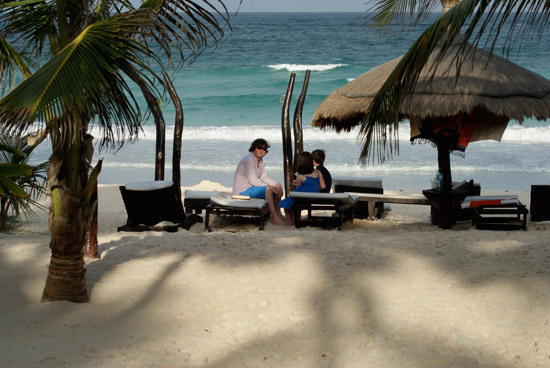 After all, Tulum is “off the grid” and many hotels don’t even have electricity 24/7. Instead we packed travel-sized games like Sorry, Uno Spin, Apples-to-Apples, a deck of cards, and what I thought was a ton of books. I was astounded at how fast my kids blew threw those. I saw this as a real opportunity for our family to unplug, stop looking at our screens, and plug into what was important – each other. Using Locogringo.com we made reservations this year at Villas Las Estrellas. Sandwiched between Los Liros and Shambala, our little slice of paradise was a bit hard to find at first. But when we did, Giuseppe greeted us warmly and showed us to room #2. With a large King sized bed, plus a twin and a trundle bed underneath we found it was perfect for families. We were on the ground level so from our balcony we were able to step right out onto the powdery, sandy beach. The waves were only a hundred steps or so away—convenient and wonderful to fall asleep to at night. This small boutique hotel has 6 beachfront rooms, as well as a reception area that serves as a lounge and restaurant. You can sit for a drink/coffee, eat your breakfast, (included) of warm pastries and fresh fruit, or enjoy an amazing dinner – simply delish! It's easy to walk to other establishments for lunch and dinner, but I recommended eating at least once at Villas Las Estrellas. The beaches of Tulum are scarcely populated and it's not uncommon to find yourself alone in the water. Our days were spent boogie boarding and body surfing. The water is clean, warm and has great waves helped by the steady breeze coming from offshore. 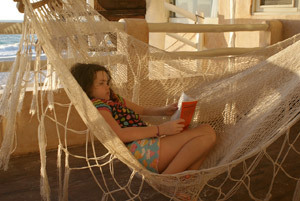 We’d read, lounge in the hammocks; go for long walks on the beach and just reconnect with each other. Mid-day we’d head out to find a place like Om or Las Ranitas for lunch. Every place is so low-key, not only are reservations not required, neither are shoes. Our kids tended to head back to the beach while waiting for our food to arrive. They would make a game out of jumping of the stairs, palm trees and other things. You will find there are not many rules. Kids probably wouldn’t get away with these antics at a big resort. If lying around all day isn’t your thing, there is plenty to keep you and your kids busy. You can go to the ruins, swim in a cenote, visit a water activity park like Xel-Ha or Xcaret or teens can even learn to kite-surf. The first year, we visited the Tulum ruins. This is a very cool archaeological site for kids to see that is so close, you shouldn’t pass it up. A few things to keep in mind: it is hot there with limited shade and no snack stand beyond the front gate. However, there is a nice beach, accessed down a long set of stairs so bring your suits for a quick dip off. The gravel paths are going to make it hard to push a stroller so plan accordingly. This is a great place to spy iguanas so don’t forget your camera. So what is a cenote? This natural wonder is best described as an underground sinkhole. After the cave falls in, what's left behind is a cavern. Some are partially closed; some are open to the sunlight. Stalagmites and stalactites grow in them. Some even have bats. And there are definitely great fish to observe. You can explore them on your own, but we felt more comfortable snorkeling at Cenotes Dos Ojos with a cavern guide. You can find one of these in town a local dive shops. Everyone knows eating can often be a challenge when traveling with kids. 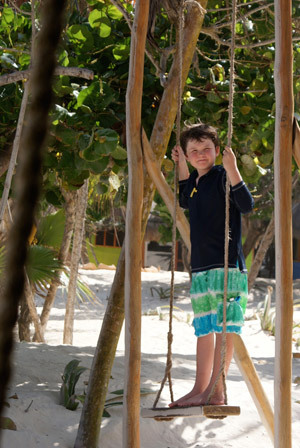 Luckily, the food in Tulum is not only outstanding, but we thought it was rather kid friendly as well. Oddly enough in additional to all the great Mexican food, there is a lot of Italian. So finding a wood fired pizza or a bowl of pasta is pretty easy to come by. As a matter of fact, we had excellent pizzas at La Neve the day we decided to explore the town of Tulum (a few miles inland). Back on the beaches, La Zebra has an adorable kids playground as well as highchairs. Our son has his first tableside flambé at Ana Y Jose. The $135 pesos we spent on that flaming dessert elicited more “muchas, muchas, gracias” then we heard him say all week. It is worth mentioning that Ana also has a true kids menu with burgers, chicken fingers, quesadillas and pasta. The only place you might need a dinner reservation is Posada Margherita – a popular spot not to be missed for food connoisseurs. ✔ Pack snacks for kids no matter their ages. For my 9 & 12 yr olds I brought fruit leathers, energy bars, goldfish, etc. Keep them in Ziploc bags. ✔ Headlamps are great for reading and walking on the beach at night. Don’t overpack. You will be surprised how little you really need. Leave your hair dryer and those extra shoes at home. ✔ There is a large grocery store (the San Francisco) at the intersection of Highway 307 and the road to Coba/Tulum. It has a very large baby aisle with diapers, baby food, etc. You should have no problem stocking up there. ✔ You can’t go wrong with a small can of bug spray in case that wonderful breeze does die down. ✔ Expect the unexpected. If you can’t handle the occasional gecko or a crab in your room, this vacation is not for you. The Mexican government plans to build an international airport in Tulum within the next few years. We're not sure what this means to our favorite sleepy, beach town of Tulum, but you may want to visit now—just in case. 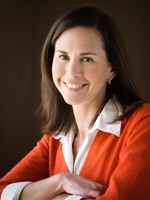 Dana Freeman started FindandGoSeek.net, the fastest growing on-line destination for families to discover what to do and see in Northern Vermont. She is the Editorial Director, a.k.a Miss Magpie. As a compulsive fun seeker, Miss Magpie, is out there taking copious notes on what her family encounters. Recent accolades and achievements include making the "Social Media 40 over 40 list in 2010" and FindandGoSeek has been named by Hybrid Mom as one of the "Top 20 Fall Family Activities Blogs of 2010". Follow Dana on Twitter. I have heard TULUM is overcrowded ad very touristy. Your article makes it sound off the beaten path and deserted beaches, etc. Can you lend some insight — email me at musicforchange@hotmail.com as we would love to go there but would prefer not to go to a tourist trap. Hi Dan, actually Tulum is still very relaxed and bohemian. I recently stayed at a “hotel” that consisted of 5 cabañas…we pretty much had the (amazing) beach all to ourselves.